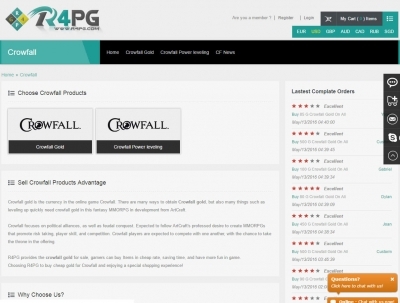 Buy Cheap Crowfall Products And Currency R4PG! Crowfall gold is the currency of the online game Crowfall. There are many ways to obtain Crowfall gold, but also many things such as leveling up quickly need Crowfall gold in this fantasy MMORPG in development from ArtCraft. Crowfall focuses on political alliances, as well as feudal conquest. Expected to follow ArtCraft's professed desire to create MMORPGs that promote risk-taking, player skill, and competition. Crowfall players are expected to compete with one another, with the chance to take the throne in the offering. R4PG provides the Crowfall gold for sale, gamers can buy Items at the cheap rate, saving time, and have more fun in the game. Choosing R4PG to buy cheap gold for Crowfall and enjoying a special shopping experience!